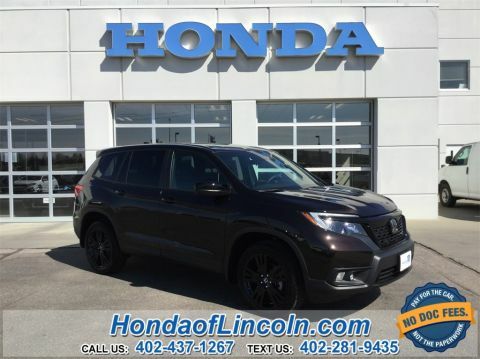 2019 Honda Passport Sport AWD 3.5L V6 24V SOHC i-VTEC Black w/Cloth Seat Trim, Automatic temperature control, Distance pacing cruise control: Adaptive Cruise Control (ACC), Exterior Parking Camera Rear, Fully automatic headlights, Garage door transmitter: HomeLink, Low tire pressure warning, Power driver seat, Radio data system, Steering wheel mounted audio controls, Wheels: 20" Split-Spoke Gloss Black Alloy. Discover the difference. Experience the value. Honda of Lincoln. 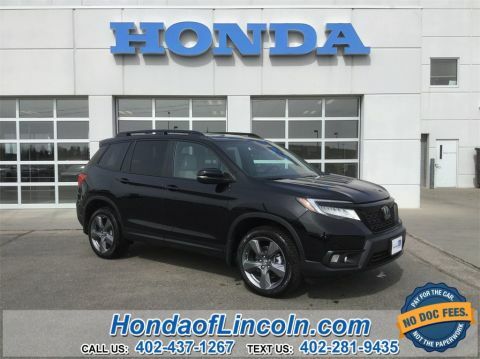 2019 Honda Passport EX-L AWD 3.5L V6 24V SOHC i-VTEC AM/FM radio: SiriusXM, Automatic temperature control, Blind spot sensor: Blind Spot Information (BSI) System warning, Distance pacing cruise control: Adaptive Cruise Control (ACC), Exterior Parking Camera Rear, Fully automatic headlights, Heated door mirrors, Heated front seats, Illuminated entry, Low tire pressure warning, Memory seat, Power driver seat, Power Liftgate, Power moonroof, Power passenger seat, Steering wheel mounted audio controls, Traction control, Wheels: 20" Split-Spoke Pewter Gray Alloy. Discover the difference. Experience the value. Honda of Lincoln. 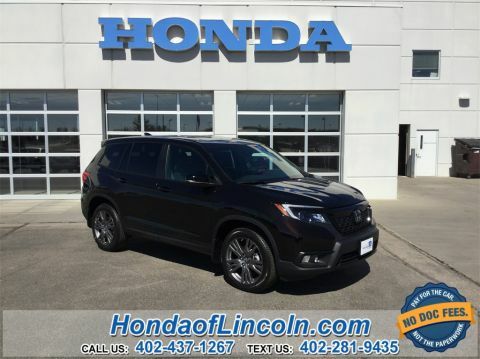 2019 Honda Passport EX-L AWD 3.5L V6 24V SOHC i-VTEC Black w/Leather-Trimmed Seats, AM/FM radio: SiriusXM, Automatic temperature control, Blind spot sensor: Blind Spot Information (BSI) System warning, Distance pacing cruise control: Adaptive Cruise Control (ACC), Exterior Parking Camera Rear, Fully automatic headlights, Garage door transmitter: HomeLink, Heated front seats, Illuminated entry, Low tire pressure warning, Memory seat, Power driver seat, Power Liftgate, Power moonroof, Power passenger seat, Steering wheel mounted audio controls, Traction control, Wheels: 20" Split-Spoke Pewter Gray Alloy. Discover the difference. Experience the value. Honda of Lincoln. 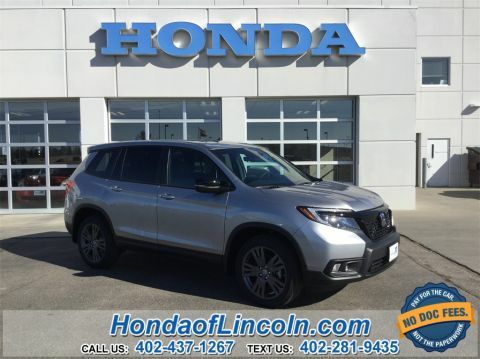 2019 Honda Passport EX-L AWD 3.5L V6 24V SOHC i-VTEC ABS brakes, Active Cruise Control, Electronic Stability Control, Front dual zone A/C, Heated door mirrors, Heated Front Bucket Seats, Heated front seats, Illuminated entry, Low tire pressure warning, Power Liftgate, Power moonroof, Remote keyless entry, Traction control. Discover the difference. Experience the value. Honda of Lincoln. 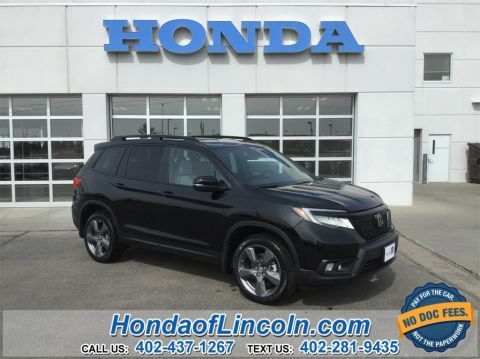 2019 Honda Passport EX-L AWD 3.5L V6 24V SOHC i-VTEC AM/FM radio: SiriusXM, Automatic temperature control, Blind spot sensor: Blind Spot Information (BSI) System warning, Distance pacing cruise control: Adaptive Cruise Control (ACC), Exterior Parking Camera Rear, Fully automatic headlights, Garage door transmitter: HomeLink, Heated front seats, Memory seat, Power driver seat, Power Liftgate, Power moonroof, Power passenger seat, Steering wheel mounted audio controls, Traction control, Wheels: 20" Split-Spoke Pewter Gray Alloy. Discover the difference. Experience the value. Honda of Lincoln. 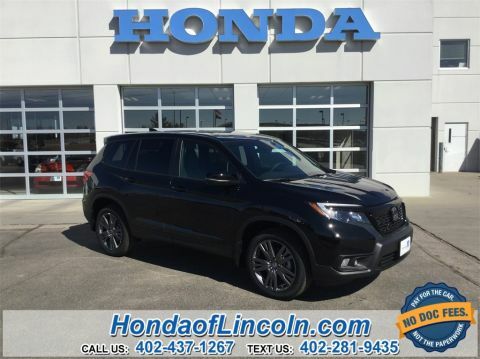 2019 Honda Passport EX-L AWD 3.5L V6 24V SOHC i-VTEC Black w/Leather-Trimmed Seats, AM/FM radio: SiriusXM, Automatic temperature control, Blind spot sensor: Blind Spot Information (BSI) System warning, Distance pacing cruise control: Adaptive Cruise Control (ACC), Exterior Parking Camera Rear, Fully automatic headlights, Heated front seats, Memory seat, Power driver seat, Power Liftgate, Power moonroof, Power passenger seat, Steering wheel mounted audio controls, Traction control, Wheels: 20" Split-Spoke Pewter Gray Alloy. Discover the difference. Experience the value. Honda of Lincoln. 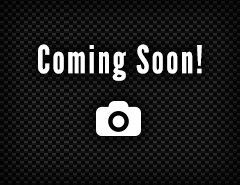 2019 Honda Passport Touring FWD 3.5L V6 24V SOHC i-VTEC Black w/Perforated Leather-Trimmed Seats, AM/FM radio: SiriusXM, Automatic temperature control, Blind spot sensor: Blind Spot Information (BSI) System warning, Distance pacing cruise control: Adaptive Cruise Control (ACC), Exterior Parking Camera Rear, Fully automatic headlights, Garage door transmitter: HomeLink, Heated front seats, Heated rear seats, Memory seat, Navigation System, Power driver seat, Power Liftgate, Power moonroof, Power passenger seat, Steering wheel mounted audio controls, Traction control, Wheels: 20" Solid-Spoke Pewter Gray Alloy. Discover the difference. Experience the value. Honda of Lincoln. 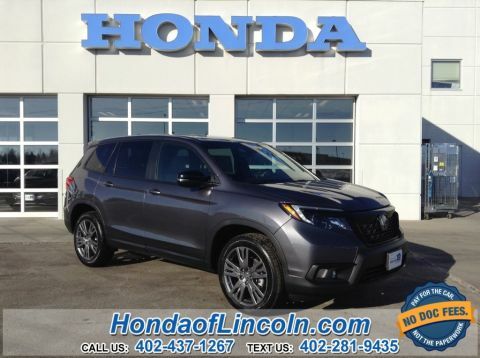 2019 Honda Passport Touring AWD 3.5L V6 24V SOHC i-VTEC Gray w/Leather-Trimmed Seats, Alloy wheels, AM/FM radio: SiriusXM, Automatic temperature control, Blind spot sensor: Blind Spot Information (BSI) System warning, Distance pacing cruise control: Adaptive Cruise Control (ACC), Exterior Parking Camera Rear, Fully automatic headlights, Heated front seats, Heated rear seats, Memory seat, Navigation system: Honda Satellite-Linked Navigation System, Power driver seat, Power Liftgate, Power moonroof, Power passenger seat, Steering wheel mounted audio controls. Discover the difference. Experience the value. Honda of Lincoln. 2019 Honda Passport Touring AWD 3.5L V6 24V SOHC i-VTEC Gray w/Leather-Trimmed Seats, Alloy wheels, AM/FM radio: SiriusXM, Automatic temperature control, Blind spot sensor: Blind Spot Information (BSI) System warning, Distance pacing cruise control: Adaptive Cruise Control (ACC), Exterior Parking Camera Rear, Fully automatic headlights, Heated front seats, Heated rear seats, Memory seat, Navigation system: Honda Satellite-Linked Navigation System, Power driver seat, Power Liftgate, Power moonroof, Power passenger seat, Steering wheel mounted audio controls, Traction control. Discover the difference. Experience the value. Honda of Lincoln. 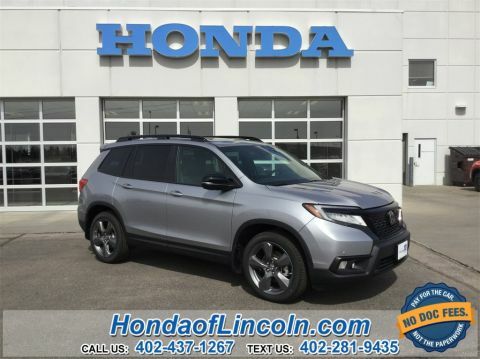 2019 Honda Passport Elite AWD 3.5L V6 24V SOHC i-VTEC Gray w/Perforated Leather-Trimmed Seats, AM/FM radio: SiriusXM, Automatic temperature control, Blind spot sensor: Blind Spot Information (BSI) System warning, Distance pacing cruise control: Adaptive Cruise Control (ACC), Exterior Parking Camera Rear, Fully automatic headlights, Heated & Ventilated Front Bucket Seats, Heated rear seats, Memory seat, Navigation system: Honda Satellite-Linked Navigation System, Power driver seat, Power Liftgate, Power moonroof, Power passenger seat, Rain sensing wipers, Steering wheel mounted audio controls, Wheels: 20" Solid-Spoke Gloss Black Alloy. Discover the difference. Experience the value. Honda of Lincoln. The stunning new Honda Accord for sale in Lincoln offers Bellevue drivers access to an impressive array of features, including standard Honda Sensing that provides Collision Mitigating Brakes, Road Departure Mitigation, Adaptive Cruise Control with Low-Speed Follow, Lane Keeping Assist, and so much more. Explore your options here and find the perfect trim for your active lifestyle, then keep reading to see why more discerning Elkhorn drivers choose Honda of Lincoln than any other dealer around. Why Choose Honda Of Lincoln? From the moment you drive up, and for as long as you own your Honda, we’re here to make sure you have everything you need to drive happy. Schedule a Grand Island area test drive of your new Honda Accord today and see what car buying was meant to be. While you’re at our dealership, be sure to ask about our Honda Accord lease specials!